Dark times in commodity markets. The single biggest factor in oil prices for the last year has been the pitched battle between OPEC and US shale producers. Each faction has been pumping unsustainably massive amounts of oil out of ground in the hopes that the other would cut production (and market share) once crude became too cheap. Different OPEC members, at different points and in their own ways, have made proposals to cut production, but no plan has emerged that the whole bloc can get behind. And because of this squabbling, OPEC emerged from its latest meeting this weekend with no ceiling on production. As Bloomberg has pointed out before, the ceiling has for years been a polite fiction at best, but without even that fig leaf, it’s hard to tell where things might be headed. 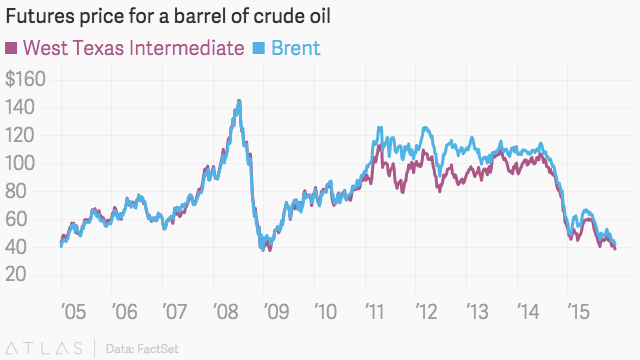 Right now, both international benchmark Brent and US benchmark West Texas Intermediate prices are hovering around $40 a barrel, the lowest prices since the financial crisis. That’s just a couple bucks from prices not seen since 2004. Cheap oil has already affected global markets and economies in countless ways, from disrupting Venezuelan politics to sinking the Russian ruble and introducing the world to “low-flation.” In a note to clients, Citi suggested that one of the only things propping up oil prices has been ETF holders thinking that they’ve gotten in at the bottom, even as larger money managers have increasingly given up on forecasting longer-term prices amid greater volatility. “Should the sticky and stretched ETF gross ‘long’ in the market finally unwind at some point in 1H’16, however, that could exacerbate a leg lower in prices,” the Citi analysts wrote. And if OPEC’s discord is the bearish signal it appears to be, then possibilities for further disruption could be, like the cartel’s crude production, limitless.